Q: When I use the Roku Media Player to play movies from my USB drive, the videos show up and play but there is no sound. The movies are all in .mkv format and they play great on the laptop. MediaInfo shows audio stream as AAC 5.1 surround sound. Can Roku play MKV? What do you guys do as a workaround? A: Roku Media Player allows you to watch videos, films, TV series and other video files from your USB drive using the Roku device’s USB port. Does Roku play MKV? Definitely, MKV is a video format supported by Roku. But if you are experiencing the Roku MKV no audio issue, the most possible cases are the incompatible audio track formats or inappropriate Roku audio settings. The following parts show you how to fix Roku media player no sound problem to play MKV on Roku without hassles. 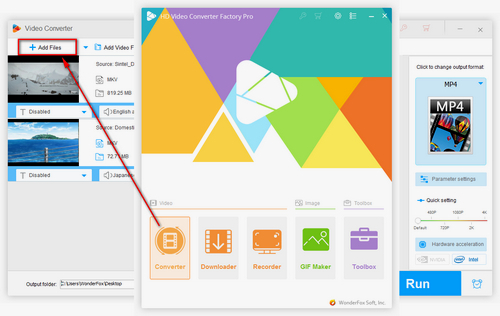 WonderFox HD Video Converter Factory Pro can help you convert MKV videos to file formats supported by Roku in batches so that you can play MKV smoothly. It’s easy, fast and powerful. In fact, Roku supports 2ch AAC, 2ch MP3, pass-through AC3, and DTS. If your MKV videos use AAC 5.1 surround sound, the video will play normally yet there is no sound in Roku media player. In such cases, you can convert the MKV with 5.1 surround sound AAC to 5.1 Dolby Digital AC3 as Roku can easily stream pass-through AC3 to an HDTV. Therefore, a good Roku MKV converter is necessary. WonderFox HD Video Converter Factory Pro offers conversions between 300+ video & audio formats and popular devices. It can help you to solve the problem with ease. Before start, please free downloadfree download and install the software on PC. 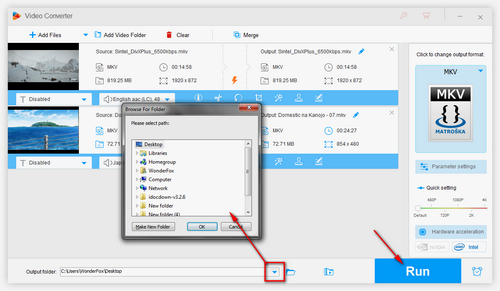 Click on the Add Files button on the top left corner, browse and select MKV videos from your PC, or directly drag and drop the files into the video converter. Tips. WonderFox HD Video Converter Factory Pro supports batch conversion mode so that it can process multiple files at the same time. Click on the Output Format button on the right, go to the Video tab, and choose MKV. The software supports various video formats and offers the best presets for popular devices, such as Samsung TV, LG TV, Apple TV, the iPhone X series, Android phone, etc. 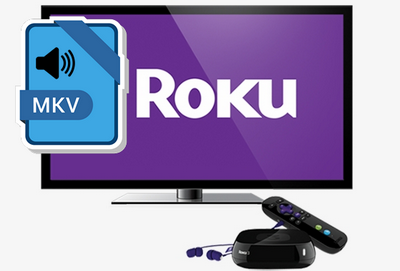 To play MKV on Roku, click on the Settings button on the lower right of the main interface. In the Settings window, go to the Audio section, open the Audio Encoder drop-down list, and select AC3. 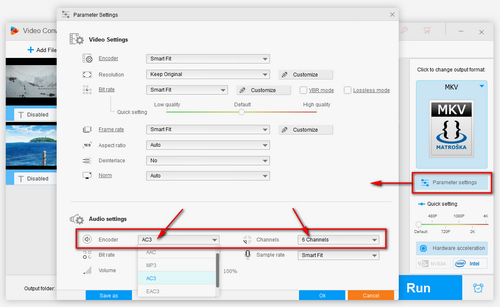 Then choose 6 channels under the Channel drop-down list. Click on OK to save the changes. Tips. You can also change other video and audio parameters, such as changing video resolution, adjusting aspect ratio, and modifying bit rate. You can select an output folder for the converted MKV files. Just click on the yellow folder button on the bottom of the software. 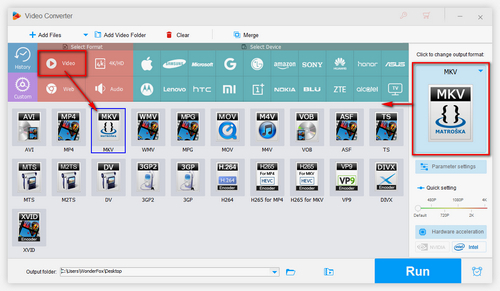 Finally, click on the Run button to start the conversion, WonderFox HD Video Converter Factory Pro is reputed to be the fastest video converter. In moments, it will prompt you to open the output folder and check the converted MKV files. Converting MKV to Roku supported formats can solve most of the Roku MKV no sound issues. Download the software now to work it out. However, if Roku media player no sound still exists, you can try to Press the Home button on your Roku remote, then scroll down to the Settings > Audio > Audio mode, switch the options right there, which should be useful. 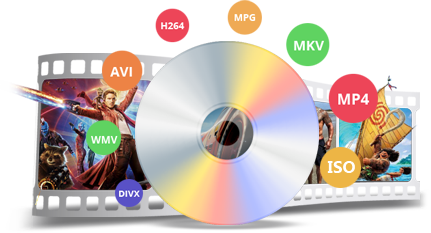 The powerful software can convert DVD discs to digital videos so that you can transfer DVD movies to USB, stream them to Roku, and play movies on TVs without a DVD player. It’s easy to handle and full-featured.